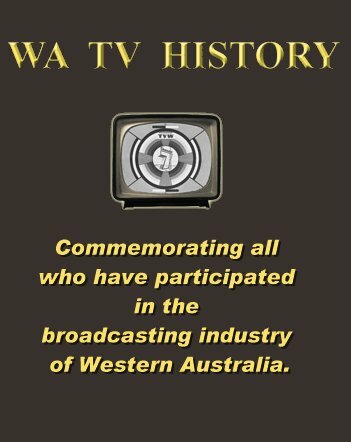 Western Australian Television History (WA TV History) » Blog Archive » “From Fixed Lenses and Black and White Cameras” – The Changing World of the TV Director by Producer/Director Keith Mackenzie. “From Fixed Lenses and Black and White Cameras” – The Changing World of the TV Director by Producer/Director Keith Mackenzie. Today’s Directors, starting out, don’t know how lucky they are with the modern “Tools” at their disposal. 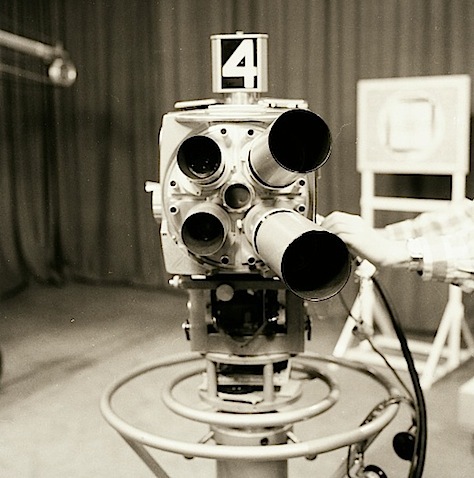 When I started Directing in 1967 the Black and White Cameras were equipped with a Turret of fixed focal length lenses with a selection of any 4 from the 2, 3, 5, 8 or 12 inch lenses available, and, maybe a small zoom lens with a ratio of 5-1 or 10-1. Turret Lenses were changed from one to the other by pressing a switch or, on earlier model Cameras, by turning a handle. 17 or 24 inch fixed lenses were available for OB’s with a selection of, by today’s standards, small range zoom lenses. There was also a 2 man operated small Vinten Crane in the Studio which could go up higher than the Studio Pedestals. Some companies also had a 4 man operated Mole Richardson long base high arm Crane. Hand Held and Radio TX Cameras hadn’t been developed in those days. Cable runs also had a limited distance. Today I’m spoilt for choice as I take my place in the Studio Control Room or OB van. All the Lenses are Zooms, and, where, not so many years ago, on OB’s, my biggest zoom lens available was a 55-1. 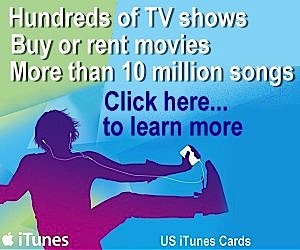 I now have the choice of 70-1’s, 86-1’s and even 101-1’s. Some of the very large lenses even have Image Stabilizers and Auto Focus systems built into them. 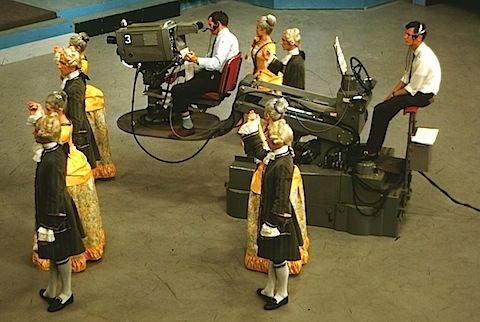 When I was Directing Cricket at TVW Channel 7 in the late 60’s and early 70’s, we only had 3 or 4 OB Cameras for a Match . Even at the BBC in 1983 we were still only using 5 Cameras for Cricket coverage. Today we use 25 Cameras or more. Most OB’s, in the early days, only had 4 Cameras available, except, perhaps, for Golf, where additional OB Vans were used, with additional Directors with their output linked back to the Main OB unit. Today, on major Sports and Concert OB’s, we use many many more. e.g. 40 Cameras for F1 Motor Racing, plus all the On-Board Cameras. For Golf around 60 Cameras are used, and, for the Winter Olympics Bobsleigh and Luge Host Broadcast coverage, I used 31 Cameras for a Downhill run that lasted around 60 secs. OB International Music Events often use around 25 Cameras. All these Cameras can now be Directed and Vision Mixed from one very large OB Unit, which, in those early days, was unimaginable. Cameras can be as small as a matchbox to fit inside a Cricket Stump or on an F1 Racing car. We have Cameras in Helicopters and Blimps, on Motor Bikes and Golf Carts, Underwater Cameras and those buried in the Ice on a Bobsleigh Track. There are Pole-cams, which are miniature Cameras on long poles to get into places that a normal Hand Held Camera can’t get to. There are Cameras travelling at speed on Rails, Tracks and Wires, positioned on the ground, vertically or horizontally, or, overhead. All of these Cameras provide a “live” feed. They can also be fitted with “Fish Eye” lenses for very wide angles. We have Steadicam mounts to create smooth walking shots. On Motor Racing OB’s I’ve positioned Cameras mounted on Jib Cranes with a reach of over 20 meters, and, on Hoists that go up as high as 72 meters, not for the nervous Cameraman. We have “Hot Head” Cameras that we can be put in dangerous positions with the Cameraman operating them remotely from a safe position. These remotely operated Cameras can also pan at very high speeds as with following an F1 Racing car. Technology today allows you to put a Camera just about anywhere you want to, and, get a “live” feed, from it, it’s only limited by the inventiveness of the Director. We have “Digital” linked Radio Hand Held Cameras that don’t even need “line of sight” to Transmit their signals back to the OB Truck. We can use Helicopters or Fixed Wing Aircraft to Radio Link Cameras on the ground back to a Control Room a long way away, as used on the very impressive French OB coverage of the Tour De France. We have Fibre Optic cables for the Cameras that can run for many kilometres, or, we can Radio Link the Cameras back to the main OB Truck. We don’t need a sub-mix OB Truck, with another Director, on large events, just because some of the Cameras are a long way away. There are also the Satellite Links, either mounted on a Truck, or, assembled out of a suitcase. Signals can now be got out from anywhere. There are no hidden locations or black spots. No more Multi “line of sight” Link paths are needed across the country to feed Cameras to OB vans or OB vans to the TV Station. We have Super Slow Motion and Ultra Slow Motion Cameras for High Definition Television, some of which can record, depending on the available light, at more than 1,000 fames per second to give sensational replays. Standard Cameras record at 25 frames per second, and normal Super-Slo Cameras at 75 frames per second. But, remember, if you replay a sequence recorded at 1,000 frames per second it will take rather a long time to replay the sequence. There is also a new system, the SprintCam V3 HD that can record at up to 2,000 frames per second, that’s a replay rate of 80 times slower than normal. At one time you couldn’t cut to a Super-Slo-Mo Camera “live” as you would see a vision lag and judder, so, they were always extra Cameras. That has been overcome, and now, all Super-Slo Cameras are cut to “live” as well as being recorded. OB vans have gone from the small, rather cramped, 4 Camera trucks with a few Monochrome Monitors inside, and a 2 row/12 button Vision Mixing panel, in a vehicle often converted from, what looked like, an old bread van, to the modern, 17 metres long, triple expanding sides, very spacious and luxurious Semi-trailers. These monsters of the road can weigh anything up to 40 Tonnes, and have Production Monitor stacks inside consisting of well over 60 Screens, and, an enormous Vision Mixing panel and Digital Video Effects machine more at home in the Starship Enterprise. I can remember when the first Colour OB units were built, the only Colour Production Monitors for the Director were those of the Transmission Monitor and a couple of Preview ones, all the others were Monochrome. I Directed many a Formula One Race with Black and White Camera Monitors trying to recognise all the different cars and the Drivers Helmets. Not just to separate all the Teams cars, but also to differentiate between the Teams individual Drivers. The Cameramen had the same problem, they had Colour Cameras, but, Black and White Viewfinders. Now, of course, all the Monitors for the Director, and the Viewfinders for the Cameramen, are in Colour, luxury by comparison. And then there are the Fly-Away Units. If you are doing, say, a Cricket OB from Bangladesh or the West Indies, and there are no suitable large OB facilities available, no problem, you take a Fly-Away Unit with you. If you need 20 plus Cameras, 5x 6 Channel EVS Hard Disc Recorder/Replay machines, a very large 64 input Vision Mixer, plus a number of Graphics feeds, the usual Stump and Super Slo-Mo Cameras, Microphones, Commentary box and Talkback facilities etc, and, there are no suitable facilities there, no problem, you take a Fly-Away Unit. Everything is packed up in London in hundreds of Flight cases and shipped out to the location where it is all built on site in a couple of days. This is quite a common and normal operation these days. Before VideoTape was developed there were no “live” replays for Sports OB’s. Then, at first, there were Videotape Replays where you had to stop recording and spool the Tape back to replay an incident. This took time and risked either not having the time to use it, or, the machine not being back in Record to cover the next part of the Event. Next there was the Video Disc, first used by BBC TV for Sport, and based in London. The term “Action Replay” evolved. This Video Disc could only record 36 secs of Video on a continuous basis, but, could replay at the same time as it was recording. Remember though, that it couldn’t store very much as you can today, so, if you recorded over that 36 secs you would lose everything recorded before. If you wanted to keep something, say for the end of a Cricket Over, then you had to dodge around that sequence, not an easy task and rather nerve racking. 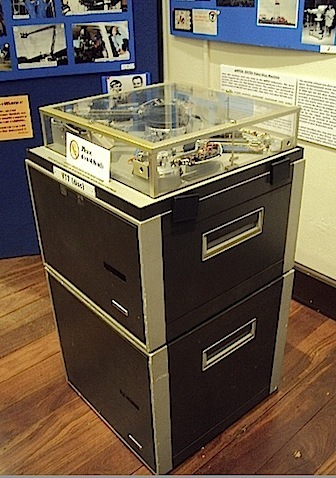 This machine couldn’t travel so it had to be operated in London at Television Centre. It was either Radio linked to the OB and inserted to air on the OB Vision Mixer, or, depending where the OB was, it had to be cut into the coverage in London. A tricky operation at the time. It was not a very popular job to be rostered onto The Video Disc operation and probably be screamed at a lot over Talkback by the OB Producer/Director. Today we have a multitude of Hard Disc recorders, many with up to 8 Channels on each. For instance, on Motor Racing, apart from the “Live” cut, we also Record all of the Cameras around the Track, all of the time, together with those Cameras in the Pits, and fixed on the Cars and in the Helicopter, so that, hopefully, we won’t miss anything important and can therefore Replay the incident, sometimes from multiple angles, while still continuously recording the Cameras outputs. We can also assemble packages and highlights as we go along. Cricket coverage, like most Sports, relies on multiple angles being ISO recorded and then replayed. Major Music OB’s also ISO record all Cameras for later Post Production. The latest Technology in Graphics and Television Camera Replays now has a vital part in assisting Match Officials in making decisions on Play, e.g. Line calls in Tennis, Stumpings and Run Outs in Cricket. The 3rd Cricket Umpire has a direct 2 way Talk Back Communication system to confer with the TV Director for Replays and decisions. We’ve also progressed from hand made or plastic lettering Graphics to very sophisticated and impressive Computer driven designs, animations and statistical information that, on Sports OB’s, are now just taken for granted. We’ve gone from 405 lines Black and White to 625 lines Colour, from Analogue to Digital, from 4×3 ratio to 16×9, to High Definition, and now, 3D Television is here with many TV Stations around the World offering specialist 3D Channels with Live coverage of Sport, Music and Events. 3D TV hasn’t worked and has been replaced with Ultra High Definition in 4K and 8K. Yes, we’ve come a very long way from those Fixed Lenses and Black and White Cameras.